It has been 10 years since Hallyu hit Malaysia, but it still shows no sign of ebbing. NOT since Zorro's “Z” has a letter evoked more passion in the popular psyche than “K”. The “K” here, of course, stands for Korea, and it has grown to be a top prefix in today's popular culture from K-pop (music), K-drama and K-movie to K-tech. Its popularity has made it a coveted prefix for various local arenas other than culture and entertainment too, such as business and politics. At the recent One Million Youth Gathering 2012 in Putrajaya, K-pop acts were featured to attract young voters, while many politicians have not hesitated to K-pop name drop on their social media network to hip up their image. In Malaysia, this craze for Korean pop culture, known as the Korean Wave or Hallyu, is thought to have begun with the debut of the Korean hit drama Winter Sonata on TV3 in August 2002. Global impact: E!news Asia’s Rooftop prince photo message campaign shows how popular Korean dramas are getting around the world, including in places traditionally not Hallyu crazy. While the term Hallyu, coined in 1999 by Chinese journalists when China started being flooded by Korean TV dramas and pop music, was not yet widespread then, South Korea had already gripped people's imagination by becoming the first Asian team to finish in the last four of 2002 FIFA World Cup tournament that June, which it also co-hosted with Japan. By the time Jewel in the Palace and Autumn in My Heart arrived on Malaysian shores, the Korean drama trend had spread like wildfire, especially with Japan catching the fever in 2003 to drive the Yon-sama (as Bae was tagged in Japan) frenzy higher. Korean Tourism Organisation (KTO) Kuala Lumpur managing director Yun Jae-Jin affirms that Winter Sonata helped to promote South Korea and its culture to the world. Not surprisingly, KTO, the Korean government and many of the republic's businesses have been quick to ride the rising wave to sell the country and their products globally. According to Yun, the surge of Hallyu can be divided into three stages the spread of Korean drama series and movies (approximately 2002-2007); K-pop (circa 2008 until now); and the not-so-well-known aspects of Korean culture like computer games, animation, history and traditional arts. “It's a long-term effort of branding South Korea and, as you can see, Winter Sonata has been successful while K-pop is now pushing the brand further,” Yun says, highlighting that the Korean government is in the midst of planning for the development of the infrastructure for stage three of Hallyu. One industry that Winter Sonata has clearly helped to boost is the country's tourism, particularly to Nami Island near Chuncheong, Gangwon Province, where it was filmed. Some 90,000 foreign tourists visit Nami Island each year, notes Yun, adding that Malaysia is the fastest growing inbound market for Korea with a 40% growth in 2011 (156,281) and 44% in 2010 (up to 113,675 from 80,104 in 2009). KTO expects the number of Malaysian travellers to reach 200,000 by the end of this year due to the growing number of Hallyu fans. Jumping from the Hallyu platform, KTO now hopes to promote other tourist attractions of Korea, particularly its natural wonders, traditional culture, local festivals (Korea has more than 1,000 traditional festivals in a year) and historical sites. Love spark: In Malaysia, the craze for Korean pop culture is thought to have begun with the debut of the Korean hit drama Winter Sonata on TV3 in August 2002. Although Korean dramas remain popular among Malaysian fans, K-pop has garnered an equal, if not bigger, number of followers over the last few years. In 2006, TVXQ became the first Korean band to perform in Malaysia, opening the gates for other K-pop stars such as Rain, Super Junior, Wonder Girls and Girls' Generation to showcase their music here. DiGi, which has been hosting various K-pop “parties” with stars like 4Minute, Beast, G.NA and recently Jay Park, is also a proponent of K-pop here. “K-pop is a music genre that is very close to the hearts of our customers, especially among the youths,” DiGi's head of marketing services Sulin Lau had said at a press conference promoting K-pop star Jay Park. In fact, a KTO survey conducted in May last year showed that K-pop has indeed overtaken K-drama as the main purveyor of Hallyu in Malaysia and elsewhere. The survey revealed that, driven mainly by the Internet and social media network, more than 53.3% of 12,085 fans from 102 countries chose K-pop as the Hallyu aspect that interested them most. The K-pop influence online was proven when YouTube invited K-pop stars TVXQ and Kara to headline its seventh anniversary concert in California recently. The 22,000 fullhouse reception for the concert reflected how the K-pop fanbase has grown not only in size but also range. In June last year, the European media was blown away by how a concert in Paris by unknown artists (to them) from a faraway land managed to sell out within minutes. Another date was added, but it was sold out just as fast. The event, recorded as the “official” debut of K-pop on the European stage, was a joint performance by artists attached to leading South Korean management company SM Entertainment, such as Girls' Generation, Shinee and Super Junior. To the European media's further bemusement, the audience, made up largely of teens and 20-somethings from all over Europe, not only shouted out the names of each singer but also sang along with the lyrics in Korean, and copied the dance moves. Later in the year, the same event was held in the United States to a similar reception while the Internet was abuzz with fan demands from Central America and South America for the concert to be held in their hometown. That is the power of the Internet, which is now driving K-pop and Hallyu around the world, says Nini, who knows only too well how the Internet is blowing up the Hallyu craze. Their entertainment news show E!News Asia has had to include Korean entertainment news in the last year. As she puts it, if you claim to be on the pulse of Asian entertainment, then you would need to keep up with Korean entertainment. 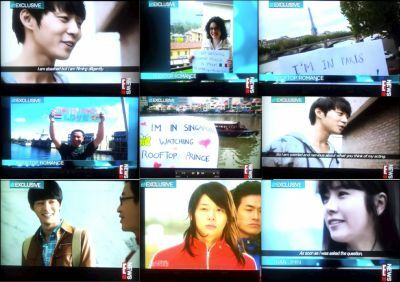 In April, E!News Asia and Korean TV network SBS invited fans from all over the world to e-mail photos of themselves and messages describing how they were enjoying the SBS drama series Rooftop Prince. The response they received came from fans from over 40 countries, which included those not normally known as “Hallyu-crazy”. These included Chile, Peru, Russia, Italy, the Netherlands, Iran and even Nigeria. “What amazed the Korean network and its drama production team was that this was the first Korean drama that has not even finished broadcasting in Korea but was already making a big impact around the world. And it is all because of the Internet,” says Nini. Another factor is the expansion of Korean broadcast networks to the region. Due to the Hallyu explosion, Astro began broadcasting KBS World, a South Korean TV channel operated by the Korean Broadcasting System in Malaysia in October 2009. AC Nielsen figures show that 1.1 million Malaysian viewers, most of them in the Klang Valley, tuned in to KBS World from November to December 2010. The higher demand for more Korean programmes prompted Astro to launch its second Korean channel in high-definition One HD in October 2010. Ricky Ow, executive vice president of Sony Pictures Television's Networks Asia (which runs One HD), says that since Winter Sonata sparked the wave, Korean entertainment has been growing exponentially over the last decade. “We see the adaptation of Korean movies in Hollywood, we see K-pop topping the charts as far away as Europe and Latin America and even more evident is the fact that Korean dramas have been delivering stronger ratings than local dramas on terrestrial stations,” says Ow. Many have tried to explain the appeal of K-drama and K-pop, especially the Winter Sonata phenomenon. Most fans would admit now that they found the 2002 melodrama overly mushy with its convoluted plot and starring an actor with a dodgy fashion sense. Revolving around the love of two high school sweethearts who discover that they might be long-lost siblings, Winter Sonata's plot was as dated as it was far-fetched. The inexplicable appeal, however, and the rippling effects it caused, could not be denied. According to culture critics, one pull is the escapism value. Winter Sonata was therapeutic, Korean culture critic Lee Young-mi told the Korean daily Korea Herald, especially after the “collective trauma of the 1997 financial crisis”. In Malaysia, like many South-East Asian countries, escapism is a major appeal of Korean dramas, not only for those who aspire to a better lifestyle but also for those looking for safe entertainment which has no explicit scenes that you would normally get in shows from the West. While academics grapple with the psycho-sociological aspects, industry players like Yun put it down to the production standards the Korean drama industry upholds, supported by the huge capital investment poured into it by both the government and corporate sector. Ow agrees, and cites another “winning formula” which is a big factor a strong cast and a good script. Whether it's a Hollywood or Korean production, the winning formula remains the same, he says. K-drama content is constantly evolving to appeal to a wider demographic, he notes. As they say, success begets success. The success of the Hallyu has thus resulted in a higher volume of more sophisticated, quality dramas produced on a bigger scale with a bigger production budget. “Ultimately, it's not the topics that matter, but how the stories are told a skill that the Koreans have mastered well, in creating a wide variety of material that resonates with the audience,” says Ow. Hallyu has also bolstered other areas of Korea's contemporary culture such as its cosmetics and beauty industry as well as fashion. Online Korean entertainment portal Maaduu.com chief executive officer Dennis Lee points out that the culture is so widespread in the region that if you go to Bangkok or Jakarta, you will feel that you are in Seoul. Another boost is in trade between South Korea and Malaysia. South Korea is Malaysia's sixth largest trading partner, accounting for 4.2% of its global trade, while Malaysia is South Korea's 12th largest global trading partner. The republic is also the country's seventh largest export destination, while Malaysia is South Korea's 21st largest export destination. The spread of Korean products and businesses to Malaysia can be seen in some ways in the growth of Korea town in Kuala Lumpur. In Ampang Jaya, Selangor, you can find many restaurants offering authentic Korean fare, grocery stores and mini marts selling all manner of South Korean delights and necessities, as well as tuition centres and Internet cafes bedecked with signage and advertisements in the Korean language. These places are seeing customers not only among Korean expatriates, whose number has been increasing over the years, but also Malaysians who are interested in all things Korean. THE Star iPad celebrates 10 years of the Korean wave in Malaysia, as sparked by runaway hit drama Winter Sonata in 2002, with a special South Korean edition, featuring the country's best from the taekwondo martial art, Korean tourism and K-pop culture to other Korean delights in Malaysia. Just download our free “The Star Malaysia, for iPad” app in the App Store to enjoy the special edition and you might also win free passes for a K-pop club night. Subscribe to our award-winning Newsstand-enabled issues to enjoy exclusive features and lifestyle stories presented interactively at no cost.